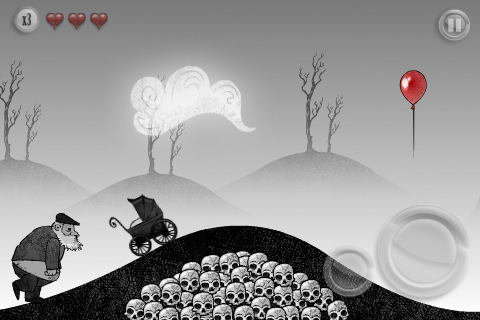 Grimm is a new iPhone game from ROBOX studios (creators of Adult Swim’s Orphan Feast) featuring a dark themed pram that must be routed through a series of obstacles filled with freakishly original black & white artwork. Grimm’s dark sceneries are somewhat reminicent of LIMBO on XBOX. So what’s with the stroller you ask? It seems a mother has accidentally abandoned her stroller on a train platform. Out comes Mr Grimm and he follows the squeaky baby carriage, haunting him along the way. You have to go forth and survive Mr Grimm’s evil attempts of wiping out your baby. Stages are padded with notes and instructions in form of poetry. Gameplay involves physics controls (tilting right/left) for movement along the platform, and two buttons, one for jumping, and another for braking. Your pram contains a baby that you can throw at obstacles along the way. Yes that’s pretty weird having to throw a baby, but that’s part of the Grimm game. But you can’t leave the child behind. He has to stay in your pram as you move forward, so you go and pick him up after a while and he gets back into the carriage. Other cool physics based tricks are elevators that require you to jump up in order for them to go up, and obstacles that you can push around to create ramps for you to jump over. Keep in mind that there is also a time limit per stage. 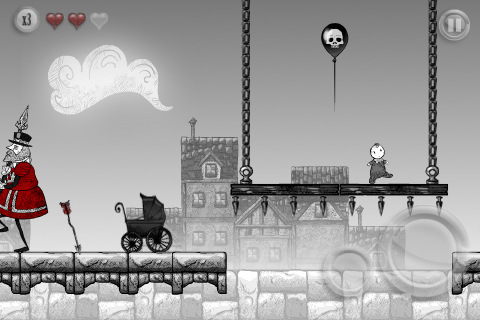 Grimm has a total of 10 worlds and 8 mini-levels, all filled with morbid characters and objects for you to kill. You get 3 lives per game. Picking up baby bottles along the way restores one life. There is an entertaining introduction stage to get you warmed up. The only recommendation would be to have an options menu where you can control the speed of the game, as it can feel a little slow at times. Overall, Grimm is an exceptionally well made game with a hint of dark humor and original content. Grimm dares to go in a new direction with physics based platformers, and comes out with a winner. Super addictive and engaging game that’s worth every penny. AppSafari review of Grimm was written by Joe Seifi on January 6th, 2011 and categorized under Adventure, App Store, Featured, Games, Platformer. Page viewed 13353 times, 2 so far today. Need help on using these apps? Please read the Help Page. Loving this game. Original and so much fun. The quirky humor is charming and witty and the artwork is truly amazing. I find it challenging to play, but rewarding when I figure out the keys to each level. Great job, Robox Studios! I love this game, but how the hell to you pass the level with the cannon? Level 10, Mr. Grimm’s Wild Ride 1? Its driving me crazy. Thanks for any help! Hey guys, I think I know where you’re stuck! You need to launch the baby into the cannon, then, once he’s in, use your finger on the cannon the same way you would on the carriage. Drag your finger down to fire the cannon. The baby should shoot up to the platform. You put the baby in the cannon. Drag your finger along the canon to aim the baby, like you normally do from the perambulator. (this drove me crazy and i wrote the app company for help) have fun! Anybody know how to get passed the water peril 2 level? The baby is in the cage hanging above the shark — but I can’t get passed that point. Ok, so once the baby is in the cage, and the shark is guarding him, pick up the coconut near the tree a little ways away and through it in the empty net. don’t fall in the net, you will die. fill the net with coconuts until it drops down to where the baby is and the baby will rise back up away from the shark. now hit the cage with a coconut and bang, baby is back in the carriage! I’ve been able to get to the end of the game, and I love it, but the last part with all the drunk guys on the fares wheel is impossible. Ive been able to kill all of them and been able to hit the cage that the baby is in once, spinning the wheel but unable to hit it again. Is that how you win the game, by hitting the cage twice while the wheel is spinning fast? Hi Trishy. David from ROBOX Studios here. Thanks and glad you’re enjoying the game! You must put the cannonball inside the metal, drag your finger along the canon And don’t let go till your finger will be on the centrum of the wheel, hit like that 3 times. I am having trouble getting past False Mother in Faerie Kingdom 3, the part where it says she has learned the trick. I shook until a bubble came up and got the head, now what? To get passed the Fairy Mother, take the bust and hit the picture of her above the fire place a few times and that should do it! What a wonderful game! Being a toddler mom I kind of put my own boy in the baby’s position – but I do not think I would catapult him out of his pram anytime soon! I am however completely stuck on Fairy kingdom 3 – the second bubble through the stone, rising above the wind grass. The bubble pops just before I am out – and then I am stuck and cannot get out of the stone in anyway. Do I miss something obvious here? @redbit — I was stuck here for a little while too….the trick is to tilt the phone so it comes up on the ar right hand side. On the left – the bubble pops on the roots in the corner. HELP!! I got the whole Cannon concept and have launched the baby to lower the platform. Now, I’m at the cannon where there is a fire and the cannon won’t launch the baby high enough to get on top of the barrels to put the fire out —- and the cannon ball does squat for me. HELP! I love the app! I only have one BIG problem… I have been stuck in Faery Kingdom for about two days because the app keeps crashing right at the loading part! Does anyone know what can I do, or do I need to reinstall the app? I love the grafics and the whole story so far! Hi Silvia. David from ROBOX Studios here. Sorry to hear you’re having a problem. Have you tried rebooting your device? That might help. You could delete and reinstall the app BUT that would mean you’d lose your progress. I’d hate to see that happen. If the reboot doesn’t work, we have a great update coming out in the next week which perhaps could help the situation. Please let me know if you can get it to work or other ways I could help. Hi Burb. This part’s a little tricky. What you have to do is: Drop the baby and pickup the cannonball. Put the cannonball into the cannon… THEN… Drag down and HOLD which will make a small target icon appear. Move the target icon over the lever that’s on top of the barrel and let go. The cannonball should explode on the lever and cause the beer to pour out. Good luck and thanks for supporting Grimm! I am so addicted to this game but I can’t get past the Faerie Mother in Faerie Kingdom 2! At the end when the carriage rolls down the hill and into her, I end up in the dream with her and it says “shake to wake” but no matter how hard I shake, nothing happens! Is this a glitch in my copy of the game, or am I missing something? Hi Arlen. Hmm, haven’t encountered a bug like this. Sorry you’re having a problem. So the goal is to shake your device until the fire goes completely out in the fireplace. Were you able to do this? Does the fire go down as you shake? Or is it just staying the same? I’m so in love with this game. The graphics are phenomenal. I’ll admit I was drawn in purely for the aesthetics being a sucker for the Edward Gorey homage but pleasantly surprised to find the game itself so charming and, well, playable. Worth far and above its dollar price tag. I’m even more pleased to find the helpful hints from David on here. I was almost stumped by a few spots in the game (the cannon, the shark under the cage) but managed eventually to figure them out. However, the final ferris wheel was really besting me and, to preserve my mental sanity, I ran to the web to see if there was someone offering some hints. Now I’m off to try to take down the wheel. Hurray for Grimm! Hey guys, the update is FINALLY out! I think it really enhances and speeds up the whole experience. I’d love to know what you think. • Multitasking: Switch between apps without losing your place! • Baby Strike! Hitting an enemy with the baby now kills them with a single hit. • Easier Baby-Launching: Simply grab the carriage with your finger and aim. No need to brake. • Faster baby-scooping by the carriage. • Speed! Faster carriage speed and game speed in general. • Better Checkpoints: The game now saves at the last point reached in a level. No need to replay what you’ve already completed. Thanks for your support and compliments along the way. I really like this game; it’s entertaining and the graphics are unique. At times, however, the game is pretty frustrating because the hints to complete a level are absent or somewhat vague. The overall concept is really good, and the game is worth the money. I’ve made it to the last level, but all the drunken men throwing bottles on the ferry wheel is really stumping me. I’ve hit the center of the ferris wheel with the cannon ball several times and the ferris wheel speeds up, but then what? The ferris wheel just slows down again, and I’m back where I started. I must be missing something, right? Does anyone know how to get past the blocking stone figuer in water peril 3, I get that I should do something with the small beach ball, but what? Thanks. I absolutely love everything about this game! I also need help I’ve been stuck on Water Peril part 2 for several days. I’m at the part where you go over the net with the sharks in it and there’s a lever a wooden cage and an empty net. My baby doesn’t get trapped in any cage, I’ve taken out both drunk guys and filled the empty net with coconuts afterwards the baby just freezes and I can’t get it. I’m so stumped on this one! I love this game, honestly it’s half the reason I wanted an iPhone because I got addicted to it on my friends. I can’t get past Evil Forest 3 though any help? Hey CC. So glad you’re enjoying the game! Thanks for playing. Help! In Faerie Kingdom 2 I get stuck in the dream with False Mother, shake till the fire goes out . . . then the dream resets and I can’t get out. Am I missing something or have I hit a software glitch?